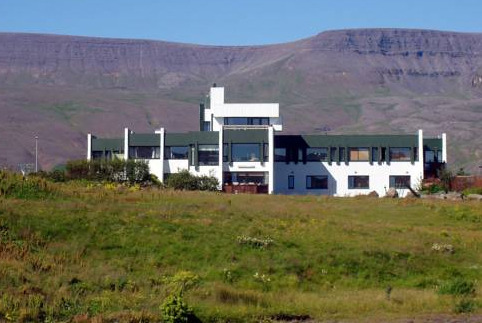 Fitjar Guesthouse is a family business nearby Reykjavik City. The guesthouse has 6 double rooms, three rooms with shower and w.c., the other three have a sink, a joint shower and w.c.
All the rooms have WiFi (wireless internet connections), a smart-tv and access to a fully equipped kitchen and laundry facilities. It is located at the banks of Leirvog, one of the better fishing rivers of this area. There is a a lot of bird life in the area. If you would like to have country side feeling and still be very close to Reykjaviks tourist- and night life this will be a perfect choice for you. When you arrive to our house you will be welcomed by Karin or Gudjon to whom you also are welcome to order your breakfast, if requested. Our kitchen has fully facilities to make your own meal. It also has a washing mashing that you are free to use. You have about four minutes to nearest service center.